City University together with Amplify Trading, would like to offer students looking to work in the financial industry a unique two-day practical experience that can directly boost their career prospects. This experience is part sponsored by Cass in recognition of the value gained by students. Amplify Trading’s world renowned financial market training simulations are used each year by corporations such as HSBC, Citibank, Barclays, Bank of China, Bank of America and Deutsche Bank for the training of their new graduate employees. These institutions all recognise the gap that exists between financial market theory and practice, and the ability of our technology to help students bridge that gap. 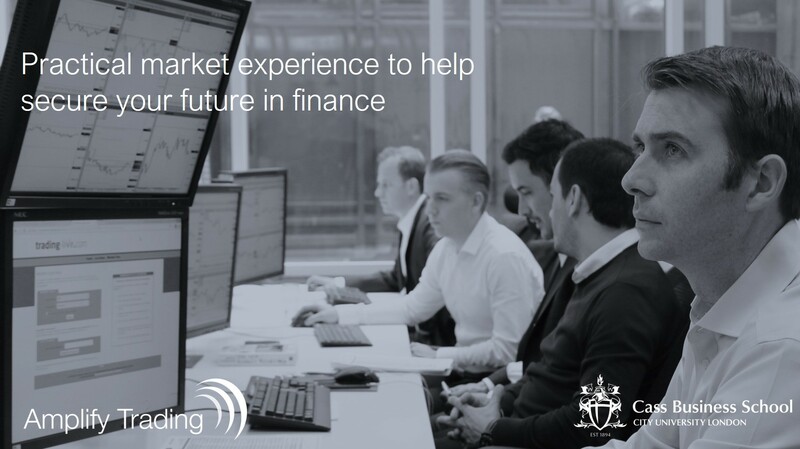 Students will be asked to engage with contemporary financial markets from the reference point of an asset manager, investment bank sales trader and a hedge fund. Students receive full performance reports as they progress through each role as well as industry recognised certification on completion. Amplify Trading has a direct connection with many of the largest employers in the industry and this unique practical insight will add significant value to any CV.